This beautifully portrayed epic family history spans one hundred years, from the 1890s during the later stages of the Qing Dynasty to the 1990s, traversing the experiences of five generations of women. Yu is the central character, whose life story is woven through the lives of her grandmother, mother, sisters, and niece. She loves her parents but at a tender age realizes they do not love her. After committing two unforgivable sins, she is sent away to live in the city but is soon abandoned. Yu's life becomes a quest for love; she is fragile but resilient, lonely but determined. Now, in the 1980s, Yu becomes caught up in the political storm and comes close to love but falls short. Her last chance at getting what she desires will ultimately come at a tragic cost. 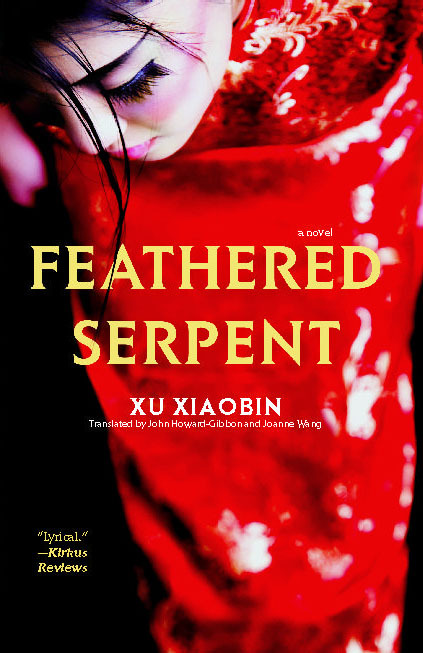 This reading group guide for Feathered Serpent by Xu Xiaobin includes an introduction, discussion questions, and ideas for enhancing your book club. The suggested questions are intended to help your reading group find new and interesting angles and topics for your discussion. We hope that these ideas will enrich your conversation and increase your enjoyment of the book. This epic Chinese family history opens in the dying days of the Qing Dynasty in the 1890s and stretches more than a century later, when student-led efforts to advance democracy were crushed by a totalitarian regime. Author Xu Xiaobin focuses her mesmerizing tale on Yu, the tragic central character whose life story is woven through the complex histories of her grandmother, Xuanming, her mother, Ruomu, her sisters, Ling and Xiao, and her niece, Yun’er. Yu loves her mother and grandmother, but at a young age she recognizes that they do not love her in return. After committing an unforgivable crime against her baby brother, the acknowledged favorite in her family, Yu runs away to live with Jinwu, a young woman with her own scandalous past. Jinwu helps Yu rediscover her emotional and sexual desires, but eventually she leaves Yu behind in search of her own destiny in America. Through heavy labor work in the fields in a remote place and then later a job as a stevedore, Yu hopes to redeem herself from her past sins and regain her family’s forgiveness. Over the course of her life, through a secret, inexplicable connection to a mystical world, Yu experiences both profound ecstasy and terrible tragedy. Eventually, she returns to her family, and begins to understand her role as third daughter in her family, and her irresistible attraction to a gigantic black mussel with feathers that inhabits the lake of her childhood home. In Feathered Serpent, all distinctions between past and present are blurred, memories of previous and present lives are intertwined, realities and illusions dissolve, and the life of the spirit is awakened. 1. “I was quite aware that the reason I didn’t like talking was that grown-ups never believed me. I saw things differently than they did.” How does Yu’s unique ability to see things others don’t separate her physically and emotionally from her family? What do you think accounts for her extraordinary powers of perception? 2. How does the birth of Yu’s brother affect her position in the family? Why does the arrival of a male heir in the family change the relationship between her grandmother, Xuanming, and Yu’s father, Lu Chen? To what extent does Yu’s six-year-old curiosity about her new baby brother seem malicious? How does Yu’s strangulation of her brother relate to her seeing a movie starring her father’s former student, Jinwu? 3. How do the author’s constant shifts from third-person narration (“she”) to first-person (“I”) narration in describing the events in Yu’s life affect your understanding and appreciation of the story? Why do you think she chose to narrate the novel in this way? How would the novel read differently were it to be told exclusively in an omniscient (all-knowing) form of narration? 4. “Sometimes she would see that huge freshwater mussel quietly opening its shell. She was never able to clearly discern what was tucked inside, until one day she suddenly had the feeling that, in fact, it was not a mussel at all; instead, it was a number of black feathers stuck on a metal frame shaped like a mussel…” How is Yu’s singular awareness of an enormous mussel opening and closing in the lake across from her home significant to the larger plot of Feathered Serpent? What does the mussel represent to Yu, and how did you interpret its recurring presence in the book? 5. What does Yu’s mother, Ruomu, reveal about her character in episodes like the betrothal of her servant Meihua to Old Zhang, her deception of her college classmate, Fenni, in order to marry Lu Chen, and constant references to her third daughter as a demon? Why is she so disaffected as a wife and parent? What role does Ruomu’s relationship with her mother, Xuanming, play in her overall demeanor? 6. Xu Xiaobin, the author of Feathered Serpent, explores the sexuality of her female characters in great detail. Why do you think she chose to incorporate these graphic glimpses of the private lives of characters like Jinwu, Yu, Meihua, Ruomu, Ling, and others? Why do you think that the author chooses not to examine the sexuality of male characters in the novel? 7. “Then a voice whispered clearly in her ear: ‘At Xitan Mountain’s Jinque Temple you can atone for your crime…’” How does Yu’s encounter with Yuanguang, the young monk apprentice to the tattoo artist Great Master Fa Yan, affect her life and open her to the possibility of love? To what extent does her journey to Xitan Mountain enable her to redeem herself in her grandmother’s eyes? 8. What does Q & A Behind Bars, the play by Yu’s friend, Yadan, suggest about the political climate of the world inhabited by the characters in Feathered Serpent? How does the presence of the monk Yuanguang (known here as Zhulong) make sense in this world? How does the uprising in the Square relate to real-life events in China? To what extent might this scene be commenting indirectly on aspects of Chinese Communism? 9. “And yet, life is full of mysteries; and so, ultimately, this would lead them to meet and attract each other.” How are fate and blood ties important to the characters of Feathered Serpent? How do you explain the unusual origins and coincidences that bring together many of the characters in the novel? 10. How is Yu’s death precipitated by her mother’s insistence on her donating blood to the gravely injured Yangyang? Why does Ruomu succeed in having Yu lobotomized, and what is the impact of that operation on Yu’s life? What does Yu’s final hallucination reveal, and how does it connect to her earlier visions? How does Feathered Serpent come full circle in its account of one family’s history? 1. Feathered Serpent’s characters are deeply aware of their individual positions in their family’s genealogy, and they constantly exchange stories about their ancestors. How much do you know about relatives of past generations in your family? Take a moment to jot down the names of as many relatives as you remember and any details you may know about them. Did they have unusual qualities that make them easy to describe? You may want to compare notes with other members of your book club. How many generations can your friends go back in remembering their ancestors? How does the American treatment of ancestors differ from the treatment of Chinese ancestors as portrayed in Feathered Serpent? 2. During her visit to Xitan Mountain’s Jinque Temple, Yu gets an elaborate tattoo on her back. How have American attitudes about body art changed over time? How many people do you know who have tattoos? Do tattoos represent more than just artistic adornment? If you were to get a tattoo, what would it be of, and where on your body would it be? Do you think you would want your tattoo in a place you couldn’t see it, like Yu? Why or why not? 3. How much did you know about China before you read Feathered Serpent? What were some of your assumptions about China and its people, and to what extent were they confirmed or negated in your reading of Xu Xiaobin’s novel? If you’re interested in learning more about the country, its politics, and its people, visit PBS’s website and test your China I.Q. : http://www.pbs.org/kqed/chinainside/quiz.html. Xu Xiaobin, born in 1953 into an intellectual family in Beijing, is a member of the China’s Writers Association. She spent nine years in the countryside and at a factory during the Cultural Revolution until 1978 when she entered the Chinese University of Central Finance just after universities had reopened and entrance examinations were held nation wide. She began publishing her writings in 1981. Currently she works as a staff screenplay writer at China’s Television Production Center. She has published numerous fictions, novellas and collections of prose.